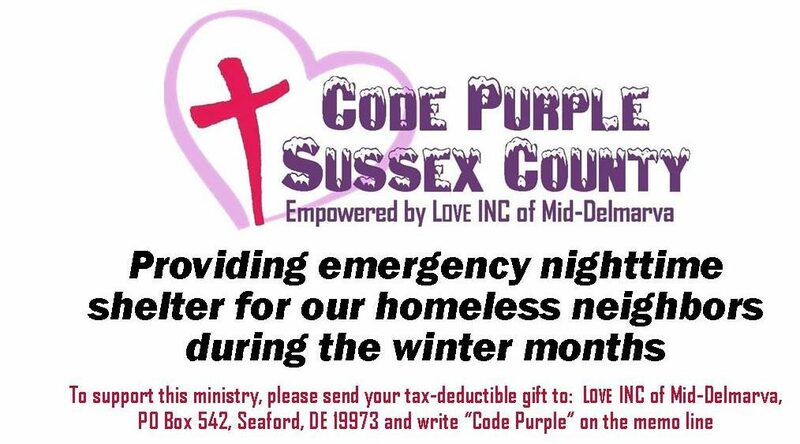 CODE PURPLE IS IN EFFECT TILL THURSDAY, MARCH 16TH, 2017. Laurel Nazarene: 94 Walnut Street (Johnson Center entrance on Maryland Avenue). Call Nikki Gonzalez at 302-519-0024. In-take 7pm to 9pm. Dinner at 7pm. Men and a separate space available for Families! This shelter is only open on Thursdays, Fridays, and Saturdays.